Our BA (Hons) Live Visual Design and Production degree has been created to meet the increasing demand for skilled visual professionals within the live events sector and creative industries. Throughout the course you will study the creative, technical and production elements required to produce visuals for live events such as video and projections. As a visual production specialist, you will be able to take a project from concept and design through to delivery on site. The degree is taught in a variety of practical and engaging ways. Masterclasses with world leading experts, project work using state-of-the-art visual software and industry placements will provide you with invaluable practical experience of working within visual production. Assessment methods include project work, written reports and visual schematic assignments. The course is regulated by the Office for Students. The facilities, equipment provision and industry links are unique within the UK and EU. Our Live Visual Design and Production BA (Hons) has been created to meet increasing employer demands for skilled visual professionals within the live events and creative industries. The course content has been developed in conjunction with a range of industry partners including d3 Technologies, FIX8Group, Green Hippo and XL Video to meet the needs of this exciting and fast-moving industry. This is a growing market with today’s live events becoming ever more visual, artistic and complex as advances in new technology create fresh possibilities within lighting and video. As a visual production specialist, you will be able to take a project through from concept and design to delivery on site in a variety of settings including, festivals, shows, stadium tours and art installations. This requires a combination of skills, which draw upon those taught in traditional subjects such as design, art, photography, content design, event management, multi-media, physics, graphics and lighting design. The knowledge and skills you acquire on this course will be transferable across a range of industries, from live music, theatre and opera, to film and TV, and architectural installations. You will graduate with the ability to produce impressive lighting and video visuals using the latest techniques, making you highly employable for a career in visual production. Graduates are already in high demand for Production, Manufacturer, and Equipment Hire companies worldwide. Working as freelancers or as direct employees these individuals are already exceeding employment expectations. As an overview of the visual production industry, this module will equip you with all the necessary methods and techniques to support your professional development. Topics include the fundamentals of visual design and production, efficient work practices, managing your well-being and safety, planning your career and developing the right attitude and expectations. You will understand the importance of developing lifelong learning skills to cope with the ever-evolving technologies and work practices. The understanding of some core concepts and industry standard software is at the heart of the degree course. This module introduces you to basic concepts of projection mapping, creative software workflow and 3D modelling. You will also be introduced to a range of creative software such as computer aided design, performance and projection mapping, and video editing programmes. This module introduces you to the processes of creative workflow and concept design in the visual production industry. Managing a diverse range of projects across many sectors and meeting your clients’ needs is key. It is imperative that you interpret the clients’ requirements appropriately, communicate your ideas and solutions effectively, and manage their expectations. This module assists you to interpret brands and products effectively, and examine how designers make the connections between ideas and images. Your learning of experiential design technologies within the live events industry commences by researching the evolution of lighting design and digital media. In this module, you will gain an understanding of the importance of style and theme, and the artistic qualities common to both light and video. In the module, you will produce a project in response to a given client brief, using examples of experiential technologies and techniques. In this module you will gain an understanding of how to interpret artistic ideas and transform them into a technological response that embraces both lighting and video. Through taught content and project work you will expand on the knowledge and skills gained to look at the basics of lighting technology and video – from virtual building blocks and interconnects, to control and programming. The purpose of this module is to prepare you for the process of transferring your project proposals and experiential technology solutions to real performance environments across a range of sectors. The module integrates with on-site rehearsals and performances, including collaborative working, allowing you to gain experience of managing a performance and evaluating its success. This module will prepare you for a work placement within the visual production industry. Before the placement commences, a series of workshops will guide you through personal development planning. Health and Safety in the workplace and management responsibilities will be discussed and you will also have a chance to refi ne your interview techniques. Work placements could range from acquiring a position within an established company through to freelancing on Production Park or external projects. Building upon skills gained from the first year Visual Production Toolbox module you will gain experience of using a wider range of industry standard software and the exploration of generative content, camera techniques, composition and video game software. The work you complete in this module will help you to produce a showreel which is based upon researched content and represents your own style and interests. When studying visual production, it is essential that you are able to engage creatively with projects, given the enormous range of clients and creative scenarios available to you. In this module you will acquire the skills and knowledge needed to undertake investigative research, which will underpin your studies and facilitate you in producing ideas of your own. This module explores the history of art, architecture, music and scenography in support of your creative research practices. In this module you will explore the expectations of audiences, designers and performers regarding artistic and technical systems and how those expectations grow each year. Working to a given brief and as part of a team, you will project manage an entire production process; bringing together a range of artistic, creative, and technical skills. The visual production sector is constantly evolving and, as part of the next generation of practitioners, you must be aware of the challenges it faces. In this module, you will conduct in-depth research into one element of the visual production industry and explore the latest national and international issues that affect it. This module will enable you to develop your own values, attitudes, style and interpersonal skills to provide a platform for continuing personal development as a visual production designer. Working to an agreed brief, you will develop imaginative concepts and work collaboratively with your client; exploring creative workflows, communication skills and efficient working methods. You will design a convergent, innovative and creative experiential technology system. Responding to the artistic and creative requirements, you will generate a professional and technical response that will enable a budget to be approved by your client. Prior to your proposed system being installed by on-site contractors and local crew you will make recommendations for any licensing and health and safety considerations that need to be implemented. The safe delivery of visual productions across the globe relies on effective project management. In this module you will study a range of management techniques and consider the impact of events on the site and the community. 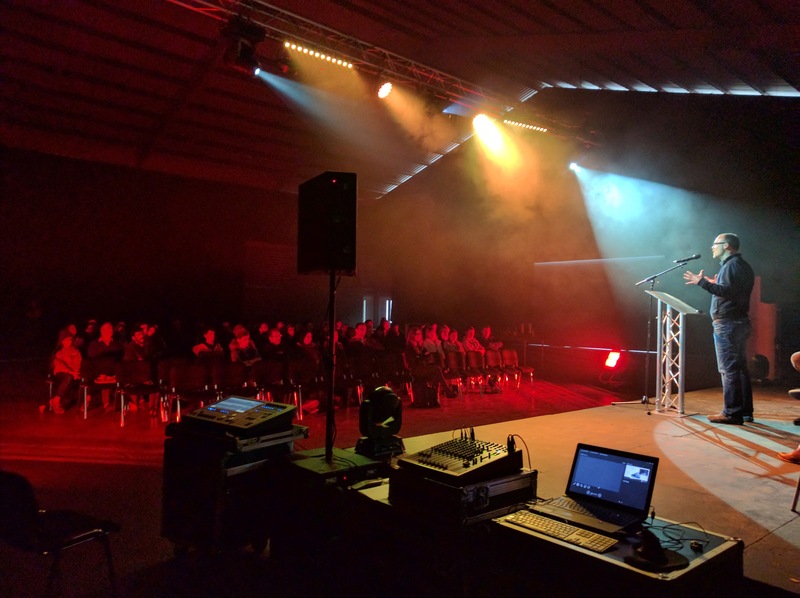 Production planning takes into consideration a range of skills so it is important that you are able to develop a professional approach to pre and post event evaluation. This module is designed to provide you with a vehicle to develop and transfer your prior learning into practical, work related skills. You will also reflect on your own personal management skills in terms of time management and working with others towards an agreed goal. The module will require you to complete a period of work placement providing you with practical experience of working in the visual production sector. The final project module gives you the opportunity to pursue a piece of individual study under the supervision of a tutor. The selected area of study must be relevant to visual production and be academically rigorous. The field of visual production has a relatively small body of research compared to more traditional university subjects so this is your chance to make a lasting contribution to the knowledge-base of the sector. As well as traditional lectures, seminars and tutorials your learning will be enhanced with visits from guest speakers and masterclass seminars from industry experts, international case studies, workshops and more importantly opportunities to work on live projects as part of both practical modules and work placement; giving you unique insights and a thorough understanding of the visual production industry operating in international markets and in a range of sectors. Assessment is via a range of methods, from developing a portfolio of your work and skills, to practical assessment and research projects. Either have 112 UCAS points (2019 entry) from at least two A levels in any subject, or BTEC National qualifications in Creative & Digital Media, Productions Arts (Theatre Technology), or similar. Or if you do not have 112 UCAS points, but have a minimum of two years relevant industry based experience, together with a portfolio of creative work (photography, animation, production design or similar) then we may still be able to offer you a place subject to you completing a diagnostic assessment and attending an interview. If English is not your first language you will need IELTS 6.0 or equivalent. Tuition Fees for this course are currently £9,250 per year for UK/EU students commencing study in 2019. Click here for information on finance and living costs. Applications are normally made via UCAS. When completing your UCAS application, please give special consideration to your personal statement, as this is the primary basis upon which we select applicants. Special consideration will be given to those without the necessary academic qualifications, but who are able to demonstrate relevant practical experience. We may additionally invite you to attend for an interview. Our interview process is relaxed and informal; it’s your chance to tell us all about your experiences, ask any questions and for us to make sure the course is right for you. We try to make sure that current students are on hand to discuss their experience of the course with you. Please apply through UCAS (the Universities and Colleges Admissions Service) for September entry. The online application form and guidance notes are available on the UCAS website. You can apply for up to five courses through UCAS (at the same or different institutions) for a fee of £24. Alternatively, if you only wish to apply for a single course at a single institution then a reduced applicant’s fee of £13 is applicable. Please register your interest and we can send you information about open days, updates on the course and information about how and when to apply. Class sizes vary depending on the topic, but mostly we limit it to groups of 10. For some of the presentation based seminars, we may teach to a larger class. For the more technical modules, you will be able to experiment with some of the equipment outside of teaching hours. What topics will I study on the course? You will study a broad range of topics, from being introduced to the industry, concept discovery and development, and creative research, to exploring the design and realisation of experiential technology systems (lighting and visual effects). You will develop a range of artistic, creative and technical skills. Alongside these skills you will be exposed to a broad range of industry standard software and hardware such as AutoCAD, d3, Green Hippo and 3dS Max. The course combines the best of practical experience, learning and development. You will receive a high level of academic and pastoral support. The learning resources to support your study are rated as excellent and include internet and virtual learning environment sources, textbooks, journals, DVDs and learning packs. State-of-the-art industry facilities such as a full d3 edit / visualisation and educational suite, Green Hippo servers and a fully equipped IT suite running the latest industry software which will enhance the standard of your creative work and your employability. In addition, our highly experienced programme staff are keen to make the time you spend with them as academically stimulating and rewarding as possible. Our programme staff enjoy a well-deserved reputation for being approachable and interested in their students’ progress, therefore as a student on the Live Visual Design and Production BA (Hons) degree programme, you are assured individual support and guidance at every stage. What skills will I develop on the course? Collaborative Team Work. Content Creation – 2D, 3D, Generative, Video Games. IT – Networking, Show Control, Rendering, Computer Specification. Previsualisation – Video Games, Media Servers, Lighting Simulation. Creative Design – concept development, creative workflows, presentation and creative brief analysis. Technical Systems – Displays, Media Servers, Show Control, Interactive Systems, The physics and maths of lighting, pixels, and visual display design. Production – budgeting, scheduling, critical path planning, project logistics, team organisation, content pipelines, project management, on-site operation skills, trouble shooting, and client management. Why is your course different/better than similar courses at other universities? This course has been specifically designed to directly meet the requirements of world-leading creative and industry suppliers operating in the visual production industry. The facilities, equipment provision and industry linkages are unique within the UK and EU. The range of teaching and learning methods ensures that students develop a professional portfolio that demonstrates their own style and creativity. The three-year programme includes periods of work placement, valued by industry and employers, which provides experiential learning, development and helps to substantiate career enhancement. Throughout the period of study students are also eligible to apply for paid and voluntary work placements through Backstage Academy. How will this help me in my career? For more detailed course information please CLICK HERE. The delivery of this course takes place on the Production Park campus. 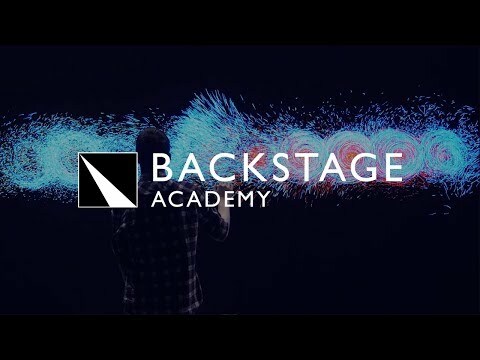 We think Backstage Academy hits the nail on the head in different ways; firstly, the close connections directly with the industry are beneficial for the students as they get connected in ways they couldn't have done without this course, and because they are creating a new generation of show designers.